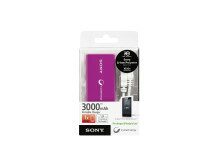 Sony has updated its range of portable USB chargers with three new models, providing a choice of different battery capacities, ensuring that you always have enough charging power for your individual needs. With 5000mAh, the CP-V5 charger is the ideal travel companion, delivering two full charges to your smartphones. Its bigger brother, the CP-V10 features a 10000mAh battery allowing you to recharge electronic portable devices several times without having to recharge your portable charger. The small CP-V3 completes the portable charger family, supplying 3000mAh, enough energy to give your smartphone a second charge. All three models come pre-charged so that they can be used right out of the box. 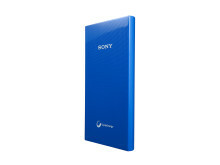 The batteries feature a 1.5A output for faster charging and incorporate Sony’s Hybrid-Gel Technology which secures minimal capacity loss of less than 10% even after 1000 charges– this way you get the most out of your charger. Weighing just 145g, the CP-V5 packs a 5000mAh Lithium ion battery, supplying enough energy to recharge your phone twice. A LED indicator lets you know when the charger is running low, giving you enough time to find an alternative source of energy. The CP-V5 will be available in black, white, blue and green and features a special anti-scratch coating to maintain the charger’s vibrant, glossy look even after heavy daily use. 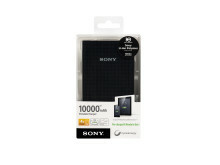 The CP-V10 from Sony will cover even your most battery-intensive activities. Measuring just 72.0mm x 127.0mm x 17.5mm, it weighs 245g and packs a 10000mAh battery. Its capacity allows for up to four smartphone charges but is also suitable for heavy use of other portable devices such as tablets and digital cameras like Sony’s RX100M3. Also using the same newly developed anti-scratch surface as the CP-V5, this further contributes to the longevity of the black CP-V10 by protecting against damage associated with everyday use, making this charger an essential companion on travels or battery-intensive working days. An added On/Off switch which prevents the battery from accidental discharge as well as four LED lights indicating the battery level gives you easy and visible control over your portable charger. As the smallest charger in the range, the updated CP-V3 features an expanded Lithium ion battery of 3000mAh. With only 38.8×99×19 mm dimensions, the CP-V3 is the perfect companion while you are on the move, doubling your smartphone’s battery life. The CP-V3 will be available in white, blue and purple for you to choose which charger best complements your style. 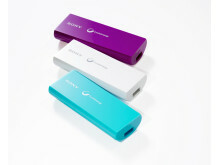 All portable chargers are available for pre-order now from www.sony.co.uk. The CP-V3, CP-V5 and CP-V10 will be available across Europe from November 2014. 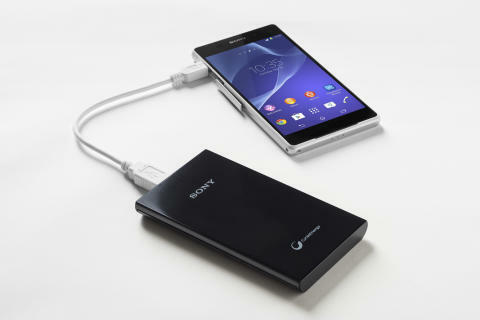 *1: Smartphone recharge time depends on battery condition, storage condition and portable device.